Sydney city has many iconic attractions that lure millions of visitors each year. The most famous of these include the Sydney Opera House and the Sydney Harbour Bridge with the stunning Sydney Harbour as their backdrop. By day the city is electric with the streets filled with business workers and retails shoppers. By night the city lights shine and the party begins. There are so many accommodation options in Sydney. Choose to stay in the financial district around Martin Place or locate yourself in the retail hub around Pitt and George streets. Also close by is a range of hotels that overlook Sydney's Hyde Park and the bustling Chinatown, which offers great access to Paddy's markets and entertainment centre. Getting around Sydney is easy. 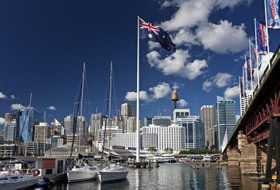 Walking distance from accommodation in Sydney's central business district you will find Circular Quay, The Rocks, Darling Harbour, Kings Cross and Darlinghurst. Travel by train from the airport direct to Town Hall Station in the city centre or you can board the light rail taking you to other popular Sydney attractions such as the Fish Markets and Star Casino.